Restore natural balance, inner calm and a blissful night’s sleep with this deeply soothing collection. Pure essential oils ease body and mind, while potent actives boost skin’s overnight processes, restoring a nourished, supple and beautifully revitalised complexion. Night Booster: In the evening prior to going to bed, mix 1 - 2 drops with your favourite ESPA moisturiser, serum or mask into the palm of your hands. Smooth into your face, neck and décolleté, repeating each evening to give skin a powerful overnight boost. Bath Oil: Use this aromatic bath oil before bed to help relax and soothe. Draw your bath, add one or two inner caps of oil, immerse yourself then deeply inhale the aroma. To intensify results, follow with Soothing Body Oil. 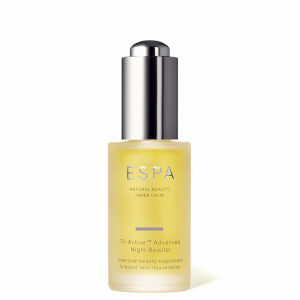 Body Oil: Best used in the evening to help relax and soothe. After your bath or shower, massage into skin in firm, upward movements towards the heart until fully absorbed. To intensify results, use after Soothing Bath Oil. Night Booster: Oryza Sativa (Rice) Brand Oil, Coconut Alkanes, Canola Oil, Camellia Kissi Seed Oil, Almond Borage Linseed/Olive Acid Glycerides, Oenothera Biennis (Evening Primrose) Oil, Nigella Sativa Seed Oil, Plukenetia Volubilis Seed Oil, Punice Granatum Seed Oil, Rosa Canina Fruit Oil, Helianthus Annuus (Sunflower) Seed Oil, Caprylic Capric Triglyceride, Coco-Caprylate Caprate, Elaeis Guineensis (Palm) Oil, Lavandula Hybrida Oil, Bidens Pilosa Extract, Linum Usitatissimum (Linseed) Seed Oil, Mirabilis Jalapa Extract, Linalool, Eucalyptus Globulus Leaf Oil, Eugenia Caryophyllus (Clove) Leaf Oil, Tocopherol, Eugenol, Juniperus Mexicana Oil, Alaria Esculenta Extract, Rosmarinus Officinalis (Rosemary) Leaf Extract, Abies Sibirica Oil, Cananga Odorata Flower Oil, Pelargonium Graveolens Oil, Pogostemon Cablin Leaf Oil, Limonene, Evernia Prunastri (Oakmoss) Extract, Citronellol, Boswellia Carteri Oil, Bulnesia Sarmientoi Wood Oil, Cistus Ladaniferus Oil, Geraniol, Benzyl Benzoate, Citric Acid. Bath Oil: Glycine Soja (Soybean) Oil, PEG-40 Sorbitan Peroleate, Prunus Amygdalus Dulcis (Sweet Almond) Oil, Tocopheryl Acetate, Pelargonium Graveolens Flower Oil, Boswellia Carterii Oil, Santalum Austrocaledonicum Wood Oil, Cananga Odorata Flower Oil, Commiphora Myrrha Resin Extract, Lavandula Angustifolia (Lavender) Oil, Linalool, Citronellol, Geraniol, Eucalyptus Citriodora Oil, Limonene, Melaleuca Viridiflora Leaf Oil, Pogostemon Cablin Leaf Oil, Benzyl Benzoate. Body Oil: Cocos Nucifera (Coconut) Oil, Glycine Soja (Soybean) Oil, Prunus Amygdalus Dulcis (Sweet Almond) Oil, Persea Gratissima (Avocado) Oil, Helianthus Annuus (Sunflower) Seed Oil, Pelargonium Graveolens Flower Oil, Boswellia Carterii Oil, Santalum Austrocaledonicum Wood Oil, Cananga Odorata Flower Oil, Commiphora Myrrha Resin Extract, Lavandula Angustifolia (Lavender) Oil, Linalool, Citronellol, Geraniol, Tocopheryl Acetate, Eucalyptus Citriodora Oil, Limonene, Melaleuca Viridiflora Leaf Oil, Pogostemon Cablin Leaf Oil, Benzyl Benzoate, Citral, Benzyl Salicylate, Farnesol, Beta-Carotene, Daucus Carota Sativa (Carrot) Root Extract, Daucus Carota Sativa (Carrot) Seed Oil, Ascorbyl Palmitate. Restore supple, nourished skin and blissful inner calm with this deeply soothing collection.